To clean and prepare the soil for sowing (amrutzpta), the owner of the farm invites friends and family members to help. The owner wears flowers and cooks a large meal for everyone. The following days, the owner returns the favor and helps at someone else's farm. Clorinda Ramirez is cooking today! There are a few stores in Tupe. Doris carries basic food to complement the local harvest. Every year, there are only two families chosen to brand their cattle. This festivity is called the wak jayra, the party of the cow. Each family gathers and makes a large meal for their guest. Family and friends come from other cities to visit on this special event. Evelyn taking the cheese home. Cheese is made on a daily basis. Children learn from a young age to milk the cows and make cheese. The cheese is kept for the months where the cows don't produce milk due to harsh weather and lack of pasture to graze. The cheese is left to dry at home in the chaclana. Some of the cheese is eaten fresh, some are sold in the closest cities, and some are kept for winter days. 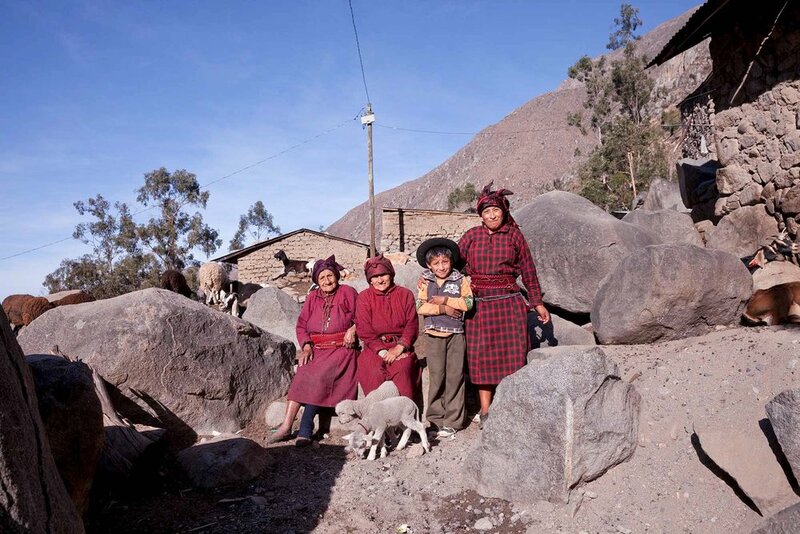 Children help with daily chores after school taking their herds to graze in the mountains. Sonia giving the finishing touches to the wak'a (belt). Getting ready for a special day! A photo shoot! Pawer spinning wool during an afternoon break. The kacxa is a thick black or dark colored blanket with colored stripes and fringes made of alpaca wool. Women can’t survive without this blanket. It is used stay warm in the cold of the dawn when they go to work or when they come back late at night from farming or returning their animals from grazing. Chuquispuma-Acevedo family. Getting ready for school! The qumpishi is a thick belt worn inside of a belt called wak’a. The qumpishi is made of a coarse thread and thin rope. It is decorated with native designs. Women wear this belt to protect their backs during heavy work. The outer decorative belt is called wak’a. They are made of colorful wool. Women make time to weave these belts. It takes days and sometimes weeks to finish one. The wak’a is almost five feet long and four inches wide. They have to pass twice around the wait to hold the qumpishi in place. Betty planting potatoes with a hoe (nampa). This tool is only used by women. Casilda sharing a drink (chamiscol) with Betty during work at her farm. Teodora planting potatoes. For good luck, it's customary to pour a little bid of flour into the new seed from the previous potato harvest. It becomes a game of who gets more flour on their faces. Eleuteria tilling the soil while wearing a mourning scarf. Doña Bernardina Cuevas also known as tia Alcida (aunt Alcida) resting by her home. She is one of the few women in Tupe who wear the old traditional outfit all year around. Katty wearing the old traditional outfit during an official function in Tupe. The original outfit is made of alpaca wool. The urku consist of three rectangular pieces that are pinned to outside of the kutuna. The kutuna is made of a lighter wool in a form of a long gown. A colorful woven border is added to the urku. During mourning, the border changes to a sober color to show that they are sad. This outfit it’s always worn with two large silver pins with eagle figures called p”itx”u. The urku are attached to the katuna with the p”itx”u. The p”itx”u are held in place with a woven thread from which piñi, made of some old silver Peruvian coins, hang. The small crib is made by the mother during her pregnancy. She carries the baby in the crib for the first few months on her back. Baby Yhomerson is ready to go with her mother, family, and friends to work on the farm. Chamiscol, moonshine, is carried in the kettle. Norma Alberto breastfeeding Jefferson, her newborn baby. Early morning at a home near Cuchapaya (back field). Celinda Payano, one of my photo students with her mom Clementina Valerio. 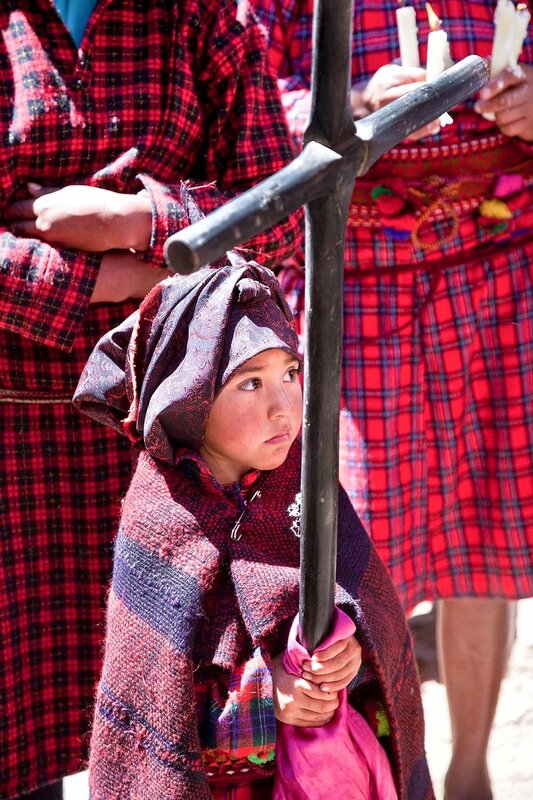 The wincxa is a scarf worn mainly to protect their hair from harsh weather. Originally it was made of thin wool but for years they have just bought synthetic fabric. During mourning, women change from red and burgundy to black wincxa. Clothes drying during the potato harvest. Elisabel & Lucy Lazaro-Ramirez getting ready for school. Although the Jaqaru women’s plaid dress seems to be very simple, it takes practice to learn how to wear it as part of the total outfit. It starts with a very straight plaid dress that falls well below the knees. The dress is folded to bring the hemline to the desired length and held in place with belts. The belts are both decorative and functional. Then the scarf is worn in a very intricate way and finally, a small blanket is worn over the shoulders to protect them from the cold. The mortar panhara and pestle tx'iki are located around Tupe for a communal use. They are used for corn and wheat. 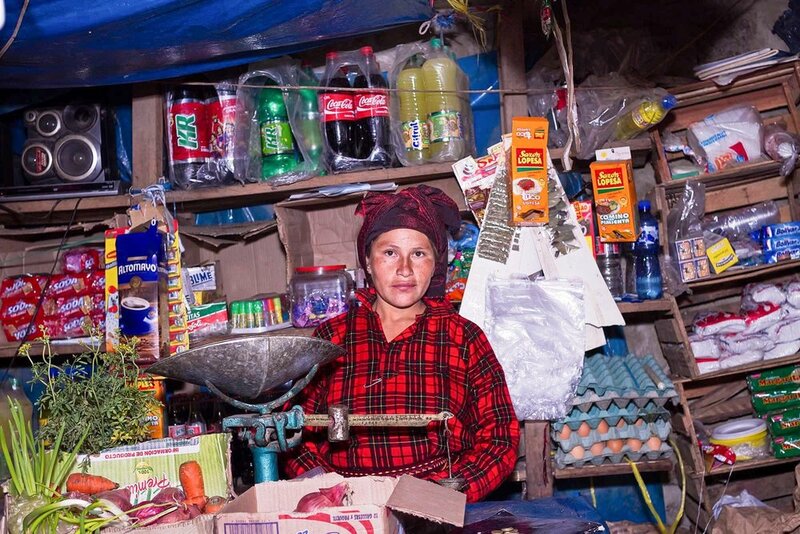 On one of my photographic journeys in the coastal mountains of Peru, I met a group of women selling herbs. They were all dressed the same and spoke a language that was not familiar to me. As a language instructor for almost twenty years, I was very curious and asked around about them. People told me that they were the strongest women in the area. 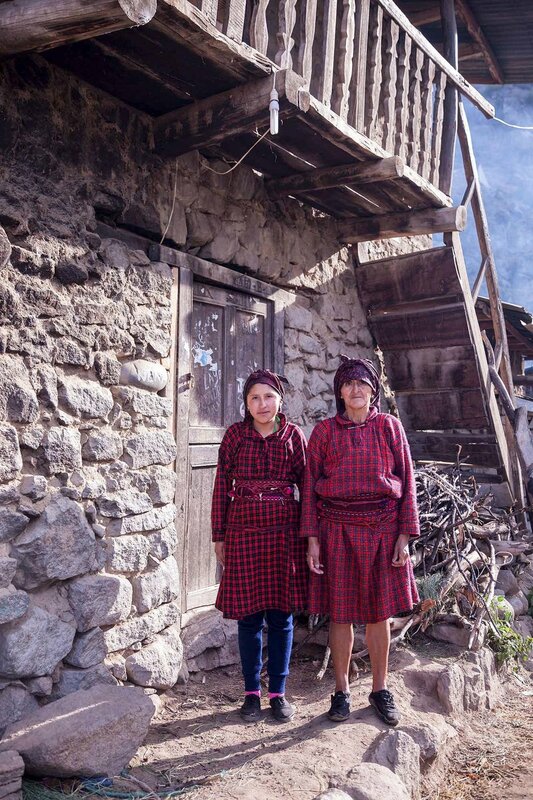 They travel by foot across the mountains to do business away from their home selling their herbs or their cattle. 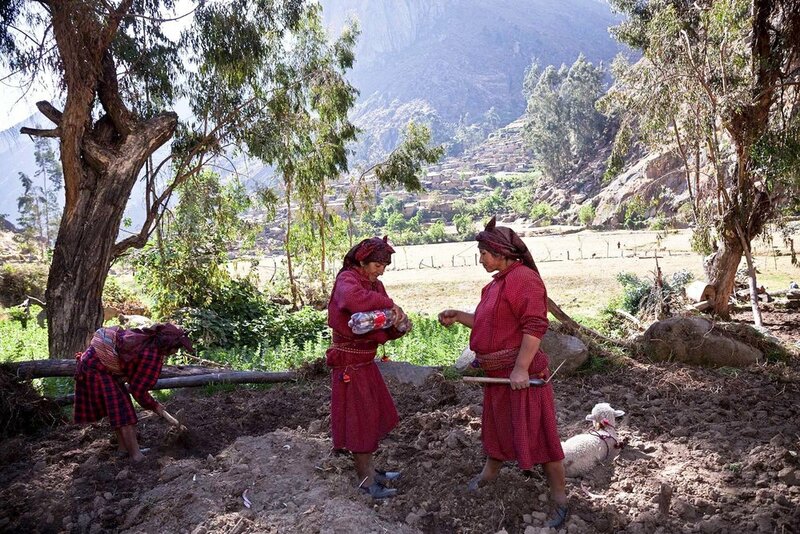 Two years later, after hours of traveling by bus, and then hiking up a steep rocky path to an elevation of 9,000 feet, I found the Jaqaru women of Peru. 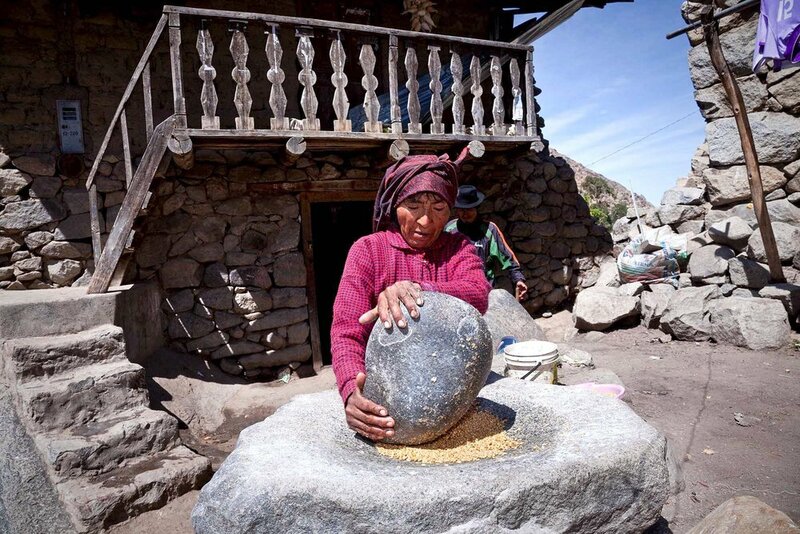 I entered San Bartolomé de Tupe, a town of 300 people, mostly women and children who speak Jaqaru, a language that is approximately 3,000 years old. Tupe is a very small Andean town in the department of Lima. There were no tourists in Tupe that day and I never met any tourists during my frequent visits to the area. Every so often, I saw anthropology students working on assignments for a day or two. I was the first photographer who lived there. I lived there off and on for a period of two years. It wasn’t easy to live in a place where running water, sewers, and roads didn’t exist. I wondered many times how Tupe’s inhabitants, especially the women, survived the cold and the hardship of this land for so many centuries. It is little wonder they are known for being strong. Tupe is so isolated that many times not even the priest or the nuns are present at their religious celebrations. It took me a long time to convince the Tupinos that I was there just to document their lives not to exploit them as they believed others had. The first year as an outsider, I concentrated on interviewing the residents, and photographing and filming community activities, daily work in the farms, their religious festivities, the branding of their cattle, and other aspects of daily life. In my eyes, their entire life was about work and survival, and women had very little time left to nurture their families.